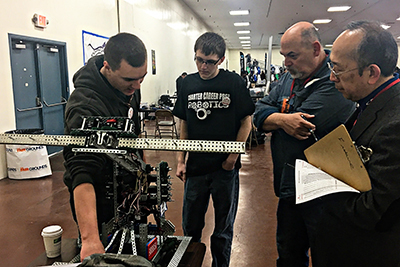 The Robotics program is part of a larger Maker Space elective program that introduces students to mechanical and structural engineering, computer programming, and design through applied learning. Seniors Tom Ostby and Kalen Nelson, along with their teammates, combined their strengths and interests to build the Vex Robot that won regional and statewide recognition. “If the first time you try to build something and it doesn’t work, keep trying,” Tom stated, noting that perseverance is an important skill to learn quickly. “We’ve rebuilt the robot so many times to correct design/programming flaws, but it’s paid off in the end.” The team members designed their robot to be durable and effective. This proved beneficial during competition, as the robot did not experience any broken parts. Students wrote more than 600 lines of programming code as part of the design process, including several autonomous functions.